Looking for a high end super fast USB drive that works out of the box on GNU/Linux and across systems (no more permission issues)? Look no further than our Penguin USB 3.0 SuperSpeed SSD Drive. Now with support for multiple file systems, out of the box support on GNU/Linux (cross-system), and maximum OS compatibility: select from EXT4, FAT32, or NTFS. Containing a high quality M.2 SSD drive inside you won't be disappointed. 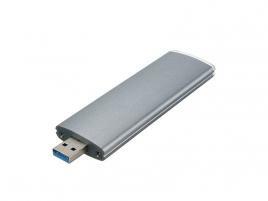 Smaller than a traditional USB hard drive and significantly faster than either a USB flash drive or traditional USB-style external hard drive. Users can expect to see speeds that are as much as 5x faster than an ordinary USB hard drive and as much as 50x times faster than many USB flash drives. Note: This item is only available for shipping within the United States or when purchased with a computer. M.2 SSD drives are a new smaller form factor type of hard drive that are much faster than traditional 'spinning disk' drives and are found in newer higher end computers. SSD drives will usually cut boot and application start times by about half. Drives over 2TB must be formatted with a file system having reduced compatibility. NTFS has read/write support on MS Windows and GNU/Linux and read-only support on Mac OS X. Drives less than 2TB can be formated with FAT32 for max support (4GB file limit).